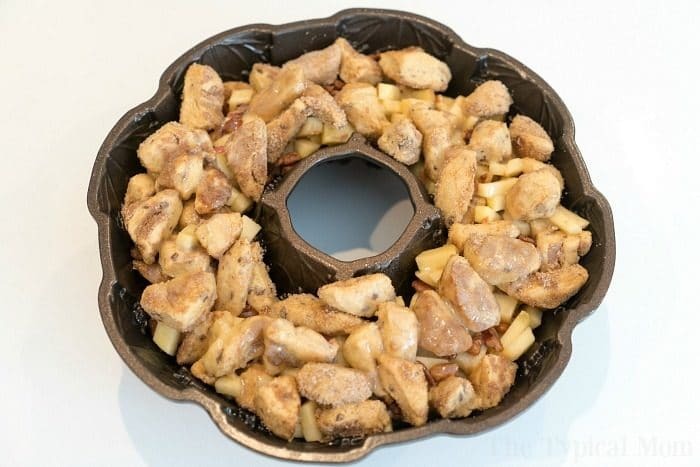 This apple monkey bread is packed full of fresh apples and really delicious! The best monkey bread I’ve made with refrigerated cinnamon rolls ever. 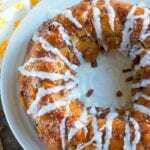 If you’re looking for the best Christmas morning breakfast recipe or just something to make on the weekend for your family, this apple monkey bread is the bomb! 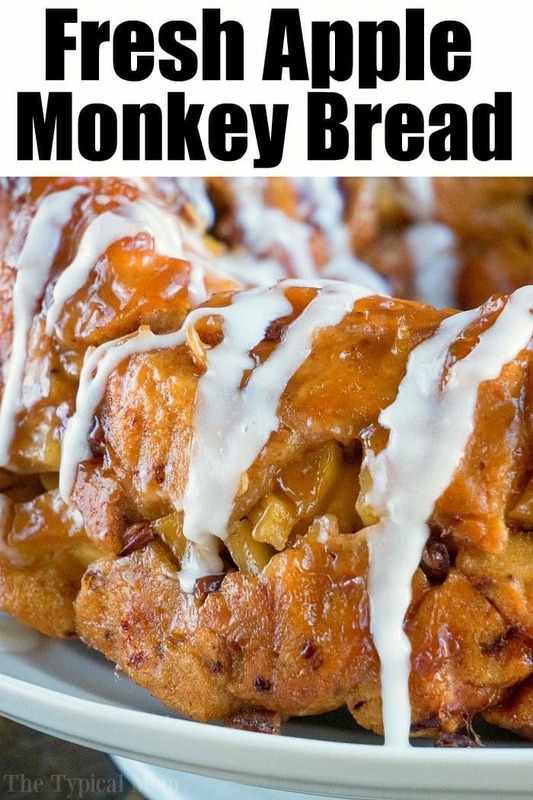 I love making Pillsbury cinnamon roll monkey bread because there are SO many possibilities to change it up with fruit, caramel, or anything else you love. Here’s the creation we made here with apple cider mix and fresh apples picked right off the tree! Like I said, making semi homemade monkey bread isn’t anything new in our house. 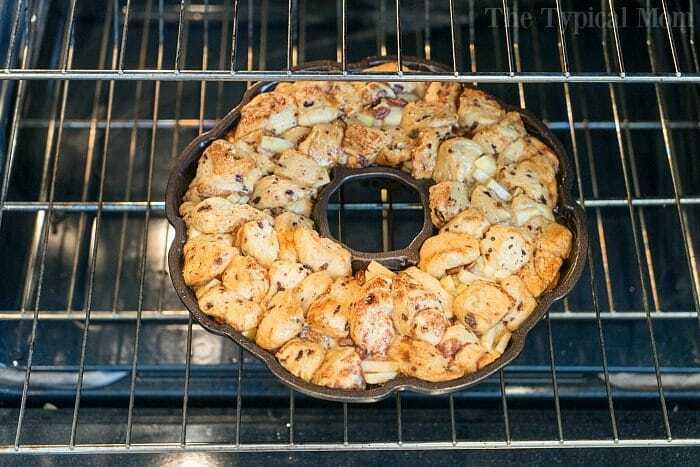 Here’s where this apple monkey bread idea began. I saw the idea in a little magazine from Taste of Home while I was waiting in the dentist office. I snapped a picture of it with my phone and tried it here changing up the timing a bit, and a few other things. So here it is before I popped it in the oven. And this is our apple monkey bread once it was done before pulling it out so you can see the color on top. It is important to NOT overbake it, you want it to be ooey gooey, but still be cooked through in the middle so it is a fine line. Very lightly browned usually is perfect, then let it cool before flipping it over to make it a bit easier. If you don’t care about it being pretty on a platter then by all means just flip it right away and use a fork to pull all the pieces right out to eat immediately. It will not look sticky sweet when you pull it out, it will look like this. All the goodness is on the bottom so don’t worry, you will get there. This is what your apple monkey bread should look like once you flip it over and drizzle vanilla icing on the top! Vanilla frosting – use what the ones that come with your cinnamon rolls, but really you need more! Here’s a video and the printable recipe for the best monkey bread ever. 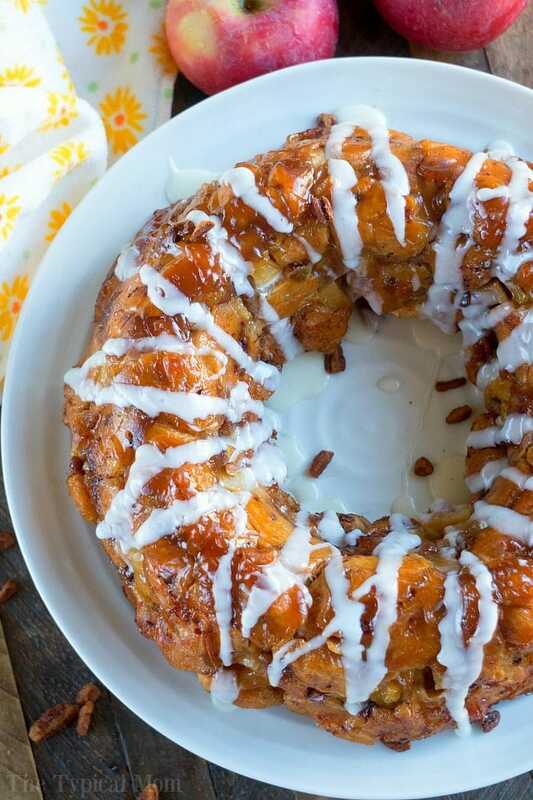 This apple monkey bread is packed full of fresh apples and really delicious! The best monkey bread I've made with refrigerated cinnamon rolls ever. Cut each cinnamon roll in fourths and put into a bowl. Core, peel, and dice apples, put into a separate bowl. Preheat oven to 350 degrees. Empty all 5 dry apple cider mix packets into bowl with cut rolls and gently toss so all pcs. are coated well. Spray non stick spray into a large bundt pan. Sprinkle 1/3 of coated cinnamon roll pieces into bundt pan, followed by 1/2 of your diced apples and 1/2 c. of nuts if you'd like to add those. Sprinkle another third of cut rolls on top of that, followed by remaining apples and nuts. Then sprinkle the remaining third of cinnamon rolls on the very top. Melt your butter, then add 1/4 c. or 1 packet from tube of icing in with butter and whisk together. Pour this mixture on top into the bundt pan. Cover bundt pan with foil. Bake in oven for 35 minutes, then remove foil and cook another 5-10 minutes or until top pieces are a very light brown. Take out and let it cool on a cooling rack. Gently loosen sides with a knife to help monkey bread slide out of the pan easier. Put a cake plate on top and flip over. May need to further loosen sides or keep pan upside down for a few minutes on top of the plate until it releases. Drizzle with remaining melted vanilla frosting and serve. 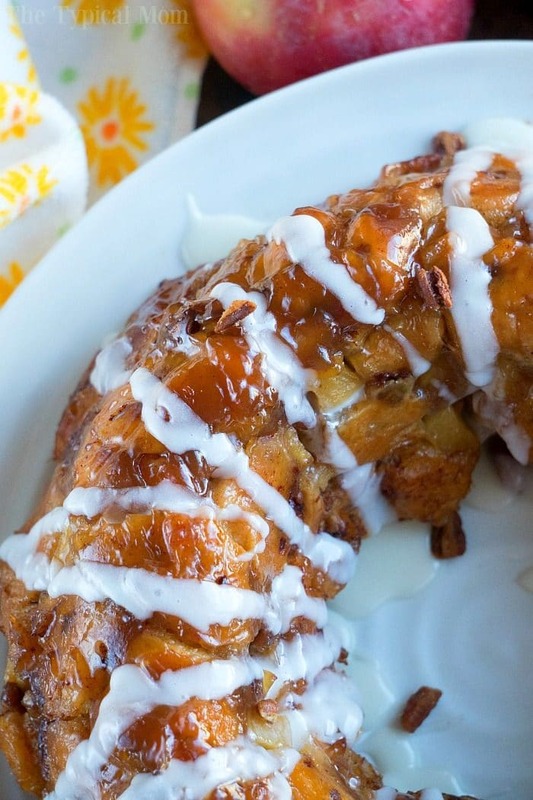 I love monkey bread, but APPLE monkey bread is even better! This was delicious!! Ah, this looks so decadent and delicious! 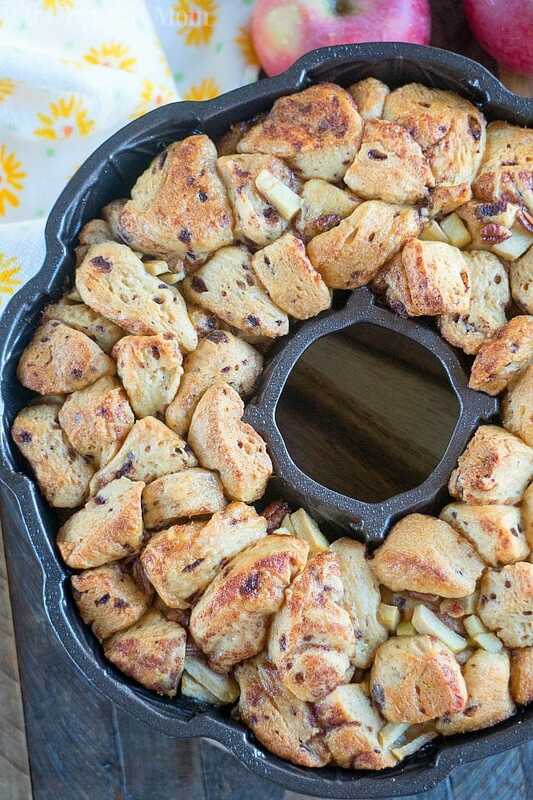 I love all of your monkey bread ideas. Your tips and instructions are really helpful too, thanks so much for the recipe!